For years, many support teams have been hamstrung by their traditional service desk platforms, which require complex, time-consuming coding for virtually every aspect of customization. This complexity makes it costly and difficult for support organizations to adapt—and places an increasingly substantial burden on the agility and efficiency of the business as a whole. 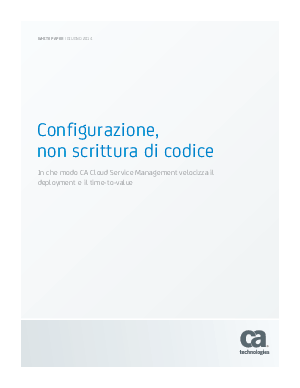 CA Cloud Service Management is a clearly differentiated alternative to traditional service desk platforms. CA Cloud Service Management is purpose-built for speed—rapidly accelerating time-to-value where other SaaS solutions fall short. Implement in days, adopt with minimal training, configure without programmers, automate end-user requests, and get automatic upgrades. Download this paper now to understand how CA Cloud Service Management can impact your business.